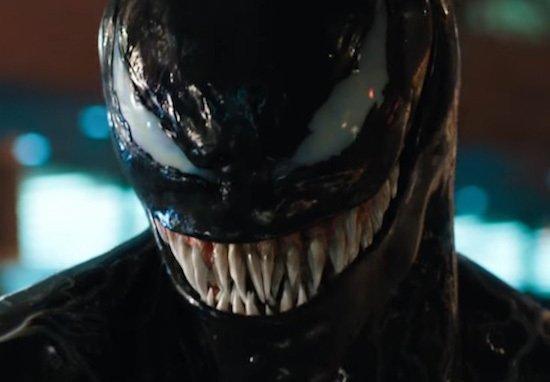 Despite a fair few bad reviews, Venom defied the critics and earned an estimated $80 million at the box office. For comic book film standards it’s not exactly a huge number, but for October openings it’s pretty damn big. According to Business Insider, the Venom opening is the ‘best ever’ for the month, easily passing Gravity in 2013, which made $55.78 million. Going into the weekend Venom had a 28 per cent score on Rotten Tomatoes, although at time of writing, it has gone up to 32 per cent. The movie earned an October record $10 million in Thursday previews, $32.8 million on Friday followed by only a 17 per cent drop of $27.2 million yesterday (Saturday, October 6). While the song Venom was already released on Eminem’s new album, the music video dropped, which sees Em quite literally transforming into Venom himself. The main news regarding Venom, however, is when Tom Hardy met a dog at the movie’s premiere on Monday (October 1), and it was pretty special. After posing for pictures and signing autographs, the 41-year-old made his way to the theatre to watch his character morph into an alien with a disturbingly long tongue. But before he made it through the doors, he came across one of the members of security – a very hard working golden retriever, named Stark. Unable to resist the dog’s fluffy face, Hardy knelt down to shake the pupper’s hand and pet him, giving Stark the recognition he deserved for doing such a good job. The canine and the actor gazed into each other’s eyes in a way which indicated they’d just become best friends – although the dog might actually have just been starstruck from being adored by such a huge celebrity. While the premiere of the huge Hollywood movie was a pretty big deal, I think Hardy and his new best friend stole the show. This is the other part of the job that I love! No matter who it is, how rich they are or how famous. Seeing someone’s eye light up and them turn to back into a child when they see my dog just makes it worth it.